Blue Star Naxos is the sister ship to Blue Star Paros, with a capacity for 1474 passengers and 230 vehicles and features all the amenities of a modern ship. Onboard you will find a selection of ensuite cabins to choose from, aircraft type seating in spacious lounges, boutique, open deck café and a self-service restaurant. Goody’s is a self-service fast food restaurant which offers all types of food from burgers to sandwiches, Goodys also offers a junior menu for the younger members onboard. In the Flocafe you will find a range of hot and cold foods as well as, teas, coffees and alcoholic beverages. Wi-Fi access is available in certain areas of the ferry, an ATM machine is onboard for those who need to withdraw money, a payphone is also available if you are unable to connect through your cell phone and kennels can be booked for your pets at an advanced request. Please Note: Whilst we have taken great care in making our Blue Star Naxos guide as accurate as possible, onboard facilities, services and entertainment may vary depending on the date and time of year that you travel, facilities mentioned may change without notification and ferry companies reserve the right to operate vessels other than those mentioned at time of booking without prior notification. Was a little choppy that day but overall would go that route again. Very comfortable. 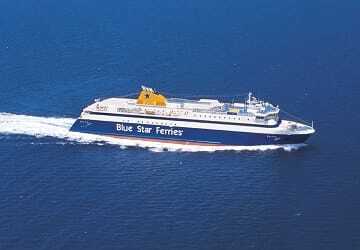 "Piraeus to Paros - Blue Star Ferries"
Contrary to some reviews Direct Ferries ticketing was efficient and problem free. Voucher was exchanged for tickets at port within 5 mins. 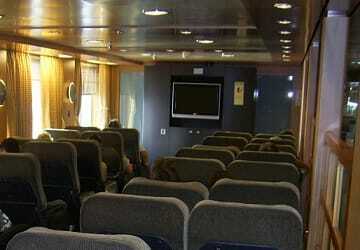 Ferry was on time both ways and very comfortable with good amenities. All round a very good experience. We had planned a sailing trip to the Greek Islands and our gathering point was Paros. The whole crew flew to Athens from different points and ferried to Paros. Everyone's trip worked on schedule and the boat were very good and comfortable. No surprises! the ticket purchases over the internet were easy to complete and everyone arrived and departed as planned. 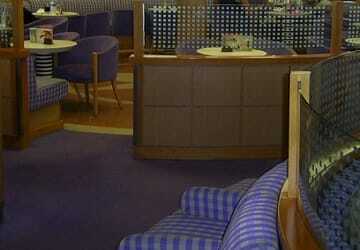 "The grand way is the best"
I love travelling in the grand old style of the Greek ferry. To me, Blue Star is the most recognisable. It may take longer than the current Sea Jets etc, but you really feel in touch with the sea and you can witness the individual island port arrivals and departures. It is also much cheaper than the Sea Jets.Going to Donoussa I travelled at night and so reserved seats which were very comfortable. Returning, we travelled during the day and so sat outside. Facilities were good and the toilet facilities were very clean. This is the second time I've travelled Blue Star and if time is not an issue then this is my preferred method of travel between the Islands. It won't be the last. All trip went well and without any delay. Perfect. "Blue Star ferry Syros to Mykonos"
"A very nice way to travel." I had a lovely comfortable trip. I purchased a seat for my passage and was comfortable the whole time. You can charge devices in there, also. 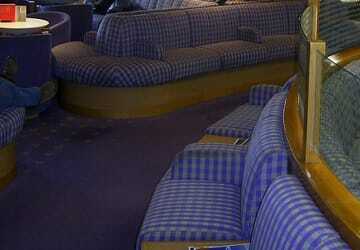 I enjoyed walking around the ship knowing my seat would still be there. Nice large windows for good view. Food at the cafe was good with fast service. 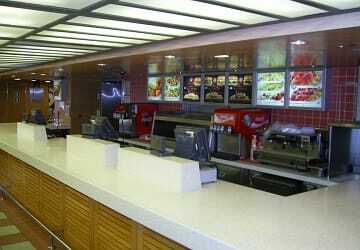 Restrooms very clean. Staff helpful and respectful. "Clean, calm, modern, air conditioned." We travelled end of May, out of peak season. The boat is very recent, from 2012. Clean, calm, modern, air conditioned. We stayed on the inside deck on an unreserved set of sofa and armchairs with a little table. You can do the same on the outside decks. I had a reservation but no tickets. I had to pick them up. It was swift. With a ticket, seems you can run towards the ferry a minute before departure! My advice. You will be asked to leave your luggage on a rack near by the entrance. You could take a bike locker to attach your bag to the frame for peace of mind during stops. The ferry was full as I was travelling after the Greek Easter holiday so glad I booked ahead ensuring my seat. Good departure time that suited our travel plans from Piraeus to Naxos. No problems with the 5 hour long trip since the areas were big to move around and the seats were comfortable. Limited food options for such a long trip. "Blue Star Ferries trip review"
Love these blue star ferries, we only had a short trip but it was fun, safe and on time. "What ' not to like." We booked on line, many months ago. Arrived at Pireaus and went to get our tickets. The lady was extremely helpful. We boarded and had great journey to Koufonissia. Not for the first time have we enjoyed Blue Star. Thank you. Nice with a big ferry with space on deck. Trustworthy and priceworthy.